Morning! It's been a while since I've shared a two-in-one outfit post and thought it was time to do one, especially after seeing how versatile this Old Navy Chunky Knit Kimono Sleeve Sweater is. I went to Old Navy to pick up a few things for the girls, and of course I left with a few things for myself. I swear, Old Navy is almost as bad as Target in that respect. You go in for one thing and come out with 50 other things you didn't even think that you needed. Or in this case, wanted. I saw this sweater and knew it would be so easy to dress up or dress down. Well, really I was initially thinking, oh what a great sweater for everyday wear! And then I thought, this would be great with a skirt too! It would look great with a longer skirt too, I was just itching to wear something short since I'm ready for warm weather and this is how I cope with it. And at $33, it looks more high end than it's price tag would suggest. For my second look (scroll below), I decided a red heel would be just the thing to elevate a simple sweater and jeans combo. 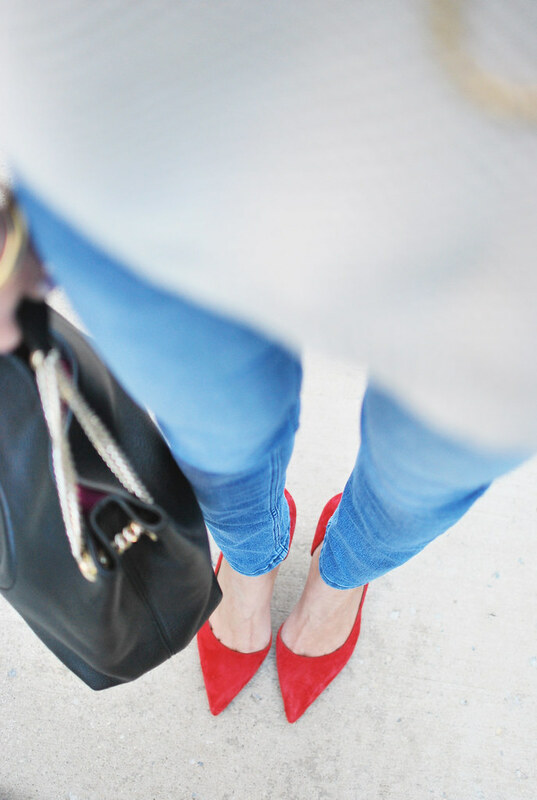 Honestly, red heels make anything look a bit more en point, wouldn't you say? As my mom says, "if you find red shoes you like, hurry and snap them up!" and so I did when I spotted these at Nordstrom Rack a few weeks ago. Paired with the classic Gucci Soho Leather Shoulder Bag and Candy Shop Vintage Charleston Rice Beads Necklace, it completed this simple yet polished look.